We are the official repository of the permanent records of the City of Edmonton. We also acquire archival material from Edmontonian citizens, organizations and businesses. Discover our holdings on our online catalogue! 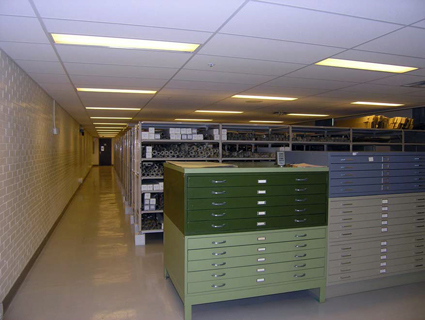 The City of Edmonton Archives acquires, preserves, arranges and describes, and makes accessible civic government records with permanent legal, administrative, financial, and historic value. A significant number of these records date from Edmonton’s incorporation as a town in 1892. Annual deposits continue to grow as a result of the City’s active corporate records management program. Finding aids to these fonds and collections are available in our online catalogue and in our reference room. We maintain an extensive collection of newspaper clippings files, dating from the 1920s. Clippings files are an excellent place to start your research; many questions can be answered from them and they are a source of keywords and names to enhance your search. Although we are not an art gallery and we do not publicly display art, we have artworks by 49 Edmonton artists in our collection. This includes work by Margaret Chappelle, Ella May Walker and George Weber. This material is usually donated to the Archives as part of a donation of records, the personal records of the artist for example. The majority of our blueprints are for commercial properties but we do have a small number of residential blueprints. To see if we have a blueprint of a building, contact us with the address at 780-496-8711 or cms.archives@edmonton.ca. Please note, you may be asked for identification or written permissions before gaining access to certain blueprints. We can make copies of blueprints; see our order form for details. We highly recommend viewing the blueprints prior to ordering. We have many other resources available if you are interested in the history of a building or property. The Archives has a small non-lending library of books, catalogues and pamphlets. We have over 700 maps of Edmonton and area starting from 1882. These maps provide a unique geographic guide to Edmonton’s development. A large number have been copied and are available in the Archives’ reference room (original maps can be retrieved upon request). Copies of maps are available for purchase. Numerous small newspapers dating from 1878 to the 1970s. We have a large number of catalogued photographs dating back to the 1880s. Reference copies are available in our reference room and many are digitized and available in our online catalogue (and we’re working to add more). High quality copies are also available for purchase. One of our larger collection of photographs was donated by the Northern Alberta Pioneer and Oldtimers’ Association (MS-56) and we have several collections from individual photographers, most notably longtime Edmonton photographer, Hubert Hollingworth.